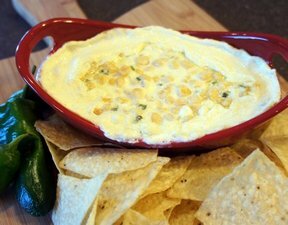 Creamy corn with the heat and spice from the jalapenos makes the perfect dip for tortilla chips. This will be a hit at your next football party. In a medium sauce pan, melt butter, cream cheese and milk over medium-high heat. Carefully whisk together until smooth and blended. 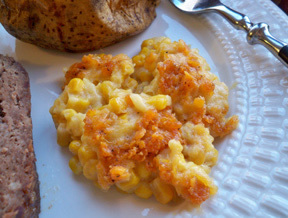 Pour corn into a square 9x9 inch casserole dish. 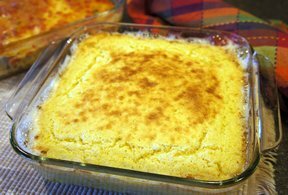 Pour melted cream cheese mixture into casserole. Add jalapenos and garlic salt. Stir to combine. Bake dish uncovered for 30-35 minutes at 350 degrees. TIP: if you like it hot, leave more of the ribs in from the jalapenos. Removing seeds and ribs takes the heat out. Use gloves when handling jalapenos. 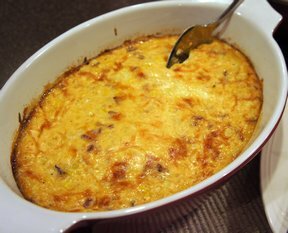 "This was an appetizer that was SO easy to make. Brought it to my neighbors as an appetizer. I would divide it in 2 or half it because even though it is very good it is so creamy you can't eat alot of it."